Hello! For today's post I have swatches and a review of new UK indie brand Little Fudges Beauty Shop. 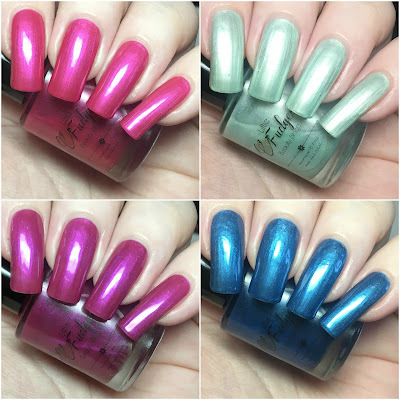 The owner Nikki was kind enough to send me four polishes from her initial 12 piece collection to share with you - these don't have an official launch date yet but it will be soon! 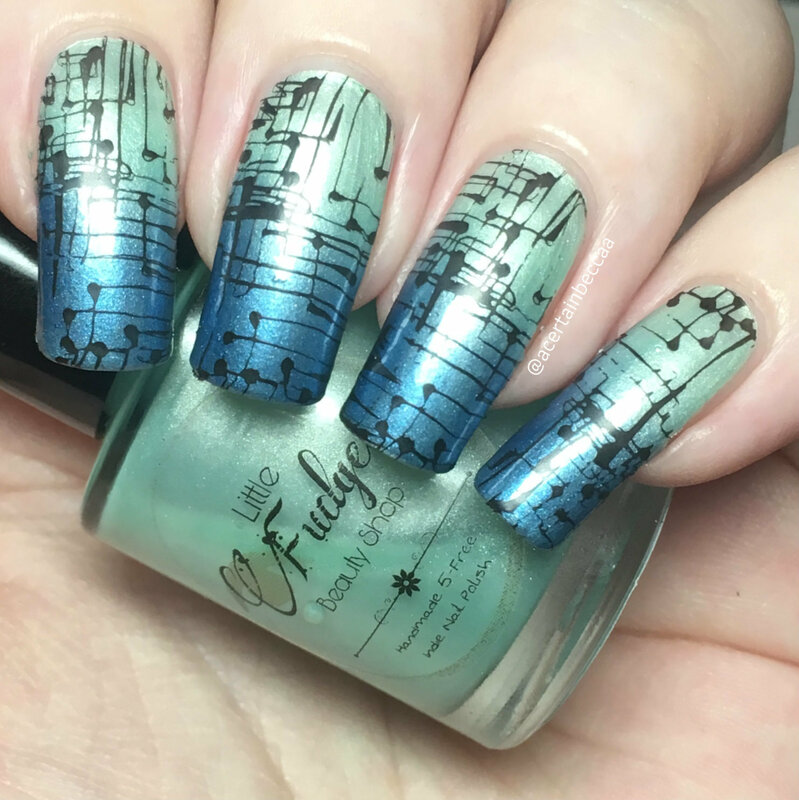 I've also done two quick nail art looks which I'll share towards the end of my post. Read on for more info! Before I start, I wanted to mention the packaging. Each polish was carefully wrapped in tissue paper with a bow and information card, and popped into a gift bag with a business card. I love the extra effort and personal touches - the cute packaging really made me smile. I also want to quickly note that Nikki is swapping to square/rectangular bottles before she opens. 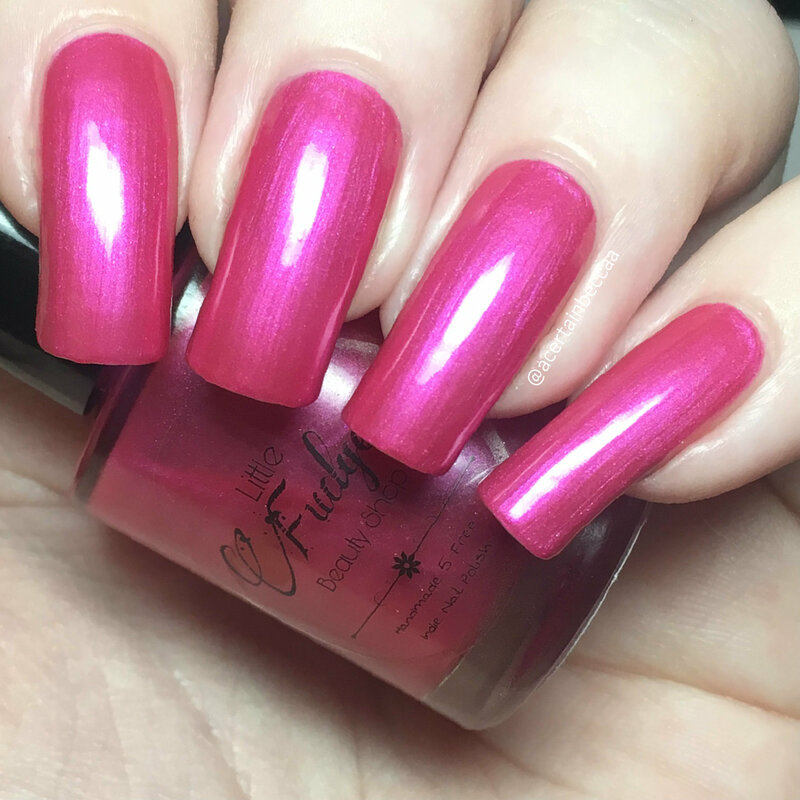 'Every Thorn Has It's Rose' is a pink base with bright pink shimmer. The formula is smooth and easy to apply. It does start off a bit sheer, but builds up well with a second. I did just about need a third, but two should be fine on shorter nails. Below is three coats with topcoat. 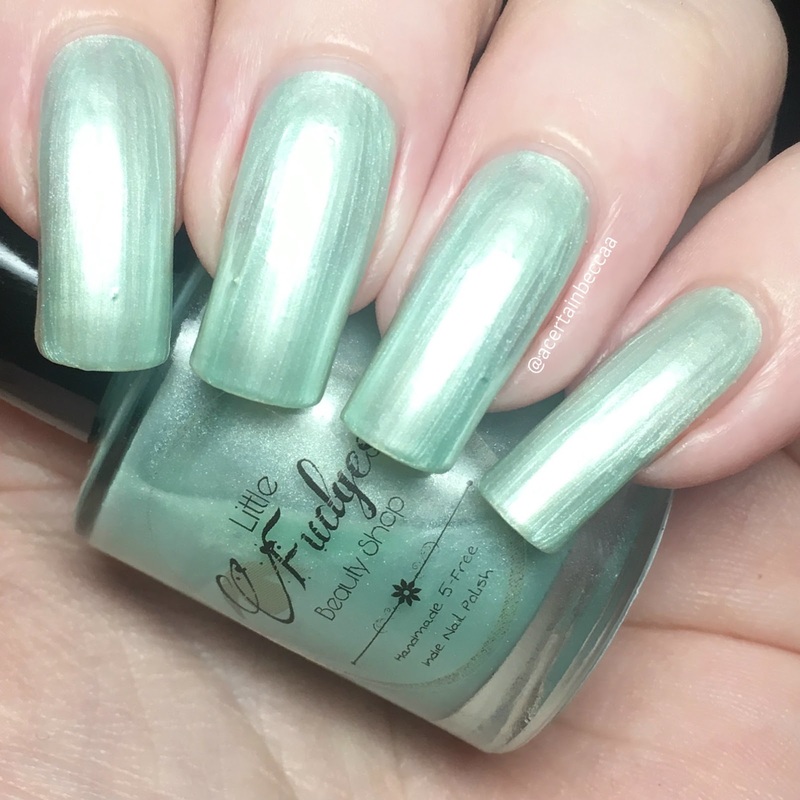 'In Your Ele-Mint' is a pale shimmery mint. It has a smooth and easy to apply formula. Being such a soft colour this starts off sheer, but it does build up nicely. It reached full opacity for me after three coats. This has a lovely sheen to it. Below is three coats with topcoat. 'Perfect Peonies' is a shimmery fuschia. The formula is possibly slightly thicker than the others, but is still easy to apply. I found this to be the sheerest of the four, and I did need a quick fourth coat. That being said, I used thin coats - so three normal coats would have been fine. Below is four thin coats with topcoat. 'Dare To Denim' is a denim blue full of shimmer. The formula is smooth and easy to apply. Like the others, this starts off sheer but does build up well. I added a slightly thicker third coat to make sure it was fully opaque. Below is three coats with topcoat. For my first nail art look, I started with a gradient of 'In Your Ele-Mint' and 'Dare To Denim'. I then stamped the top right pattern from Lina Nail Art Supplies plate Make Your Mark 02 using Hit The Bottle 'As Black As Night'. For my second look, I went for something a bit simpler. 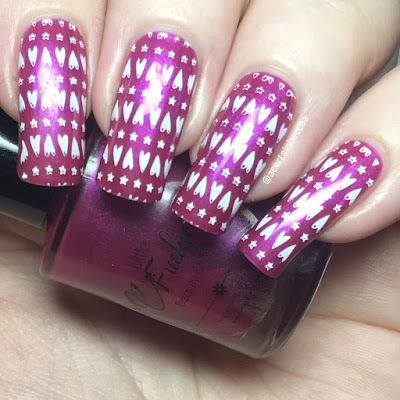 I used a base of 'Perfect Peonies' and stamped the heart and stars pattern from UberChic Beauty plate Unicorn Love using Hit The Bottle 'Snowed In'. What do you think? I love finding new brands to try, especially UK ones! Even though the polishes started off sheer, which is typical for shimmers, they had lovely formulas and built up nicely. I also think they made lovely bases for nail art and stamping. As mentioned, Little Fudges doesn't have an official launch date just yet, although I will update this post once I have more information. In the meantime you can find the Instagram page here, and Facebook page here. These polish are very different to other brands out there, they have an almost crystal effect to them, very very eye catching! And loving the nail art! So looking forward to you starting YouTube tutorials! Thank you so much for the swatches Becca. You've done an amazing job. Can't wait to work with you again.